Lacoste is the brand that made the polo shirt and a little crocodile very famous. The story begins with Rene Lacoste, a French tennis superstar, ranked number one in the world in 1926 and 1927. One would not know it considering how well he played, but Lacoste found his tennis uniform, or tennis whites as they were known, to be restrictive. At that time, proper tennis gear consisted of long sleeve button-down shirt, tie, and long slacks. Not an easy outfit to run in. Lacoste himself has said that after seeing fellow tennis player and friend Marquis of Cholmondeley play in a polo shirt, he had a bit of an epiphany and immediately commissioned a tailor a few for himself in cotton and wool. Soon after, the masses followed suit, and Rene Lacoste began his parlay into the fashion industry. In or around 1926 Rene debuted his new look at the U.S Open played in New York City. It was around this same time that Lacoste was nicknamed “The Crocodile” by media and tennis fans. The reason for the moniker isn’t clear, but it’s been speculated that it stemmed from Lacoste’s pointy nose, his boldness, or a bet he had with one of his teammates where the winner of the wager would be awarded with an alligator- skinned suitcase. Alligator somehow became crocodile, and ever since, the name Lacoste has been synonymous with the famous logo. In the early 1930’s Rene Lacoste retired from tennis and formed La Chemise Lacoste with the president of France’s largest knitwear company at that time, Andre Gillier. Together they began producing and selling shirts embroidered with a small crocodile on the chest. To gain recognition in the US, Lacoste licensed the company to the English brand Izod. In an attempt to market Lacoste as a high-end label, when it became available in the United States in 1952 it was branded “the status symbol of the competent sportsman”. Izod Lacoste had its heyday in the 1970’s and 1980’s when teenagers in particular found themselves a new trend in the polo shirts. But by the 1990’s the trend was fading fast and eventually Izod and Lacoste parted ways. Recently Lacoste has been gaining mass popularity again as the brand works to create a more modern, chic look. Today the Lacoste Corporation is based in Paris, France and produces clothing, leather goods, eyewear, wristwatches, and also – fragrances. 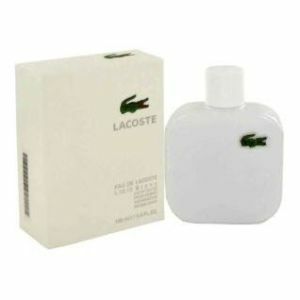 The Lacoste Perfume line for men and women debuted in 1968. Lacoste Eau de Sport, a men’s fragrance created by master perfumer Jean Patou quickly gained massive support from fans of the Lacoste brand. It has been said to have begun a new era for fans of “fresh and energetic” scents. 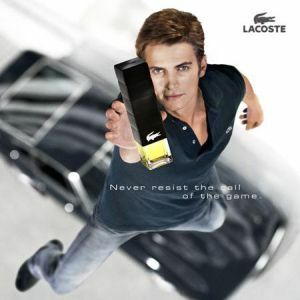 Introduced in 2005, Lacoste Essential by Lacoste can be described as masculine and modern, but with a classic flair. Composed of a unique blend of fresh and spicy notes on a sumptuous woody base, Lacoste Essential has the advantage of taking part in Time Release Technology that reanimates the fresh top note as wear goes on. Clean, bright and cheerful, it is perfect a casual daily use for a man who doesn’t have time to reapply. Inspired by the classic white polo shirt that made the company what it is today. Introduced in 2011, Blanc Cologne is a moderate fragrance perfect for casual situations. The fresh, floral woodiness keeps the wearer feeling light and cool. It lasts all day long but not in a powerful, projection way. You will forget you are wearing it until you catch a random whiff that makes you feel like you are projecting a nice clean scent to everybody around you. 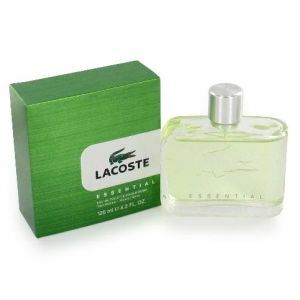 Launched in 2002, Lacoste Pour Homme is a woody aromatic fragrance for men. Distinctly clean and masculine with a hint of elegance, this fragrance is a sensual scent. The citrus and fruit form a brisk and succulent platform while the juniper and spices from the middle pop out to create a very lively accord. Incredibly versatile, pleasing and refined, this fragrance smells very rich and expensive. 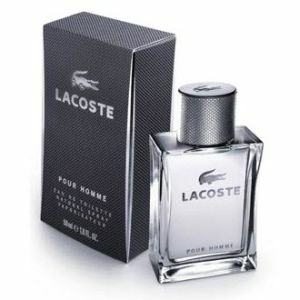 Lacoste Pour Homme will leave any man feeling reinvigorated. Eventually Rene Lacoste retired but kept the brand in the family, passing it along to his children. 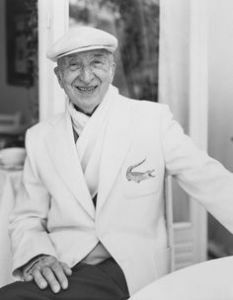 In 1996 in France Lacoste passed away at the age of 92 years. His legacy however, the famous little crocodile is alive and well popping up on somewhere near 25 million new Lacoste products every year.